This documentary, filmed at the John Bunyan Museum in Bedford, England, presents a detailed look at Bunyan's life, chronicled by John Pestell, author of Travel with John Bunyan. A look at the man who wrote The Pilgrim's Progress, the most circulated book of all time, next to the Bible. This documentary, filmed at the John Bunyan Museum in Bedford, England, presents a fascinating look at the life of John Bunyan, chronicled by Bunyan expert John Pestell, author of Travel with John Bunyan. Pestell recounts Bunyan's mischievous childhood, the nightmares that plagued him, and the events and influences that impacted his life. It was years later, well into adulthood, that Bunyan finally found inner peace. No longer plagued by fears and insecurities, he began preaching, although it was illegal to do so outside of the State church. This led to his eventual arrest and imprisonment. During the twelve years he spent in prison, he wrote The Pilgrim's Progress, the story of Christian on his journey of life. When Bunyan was finally released from prison, he took his finished manuscript to a printer, saying, "I have a manuscript of little worth." It became an instant bestseller and remains the world's most circulated book, next to the Bible. Fullscreen. John Bunyan: Journey Of A Pilgrim is an informative and superbly presented documentary that was filmed at the John Bunyan Museum in Bedford, England and presents a detailed history of this English Protestant reformer's life story as chronicled by John Pestell (the author of Travel with John Bunyan). Viewers will learn fascinating information about Bunyan's time and his experiences including a mischievous childhood, his nightmares, and those events and influences that shaped his life. Viewer's will also learn that Bunyan, well into adulthood was able to find inner peace by studying the Bible and began preaching illegally which inevitability led to his twelve years of imprisonment – during which he wrote A Pilgrim's Progress which was to become a classic of Christian literature. 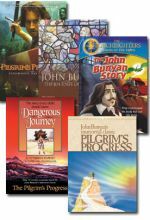 Now in a full-color DVD format and a highly recommended addition to family, church, and community library collections, John Bunyan: Journey of A Pilgrim has a total running time of 42 minutes. Best known as the author of The Pilgrim’s Progress, John Bunyan is a fascinating person. 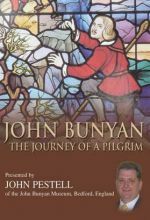 Pestell, from the John Bunyan Museum in Bedford, England, is a Bunyan expert and author of Travel with John Bunyan. In this film, he shares many small, interesting details in the telling of Bunyan’s story, including childhood incidents. Artwork helps us visualize early England and understand some of the difficulties of life in that time period. Pestell does a good job relating Bunyan’s early years of faith, family life, and eventual imprisonment for illegally preaching. Several of the anecdotes presented were previously unknown to me and added much to the interesting biography. Of course, The Pilgrim’s Progress was the resultant manuscript of his prison stay and has remained a well-circulated book ever since. Highly recommended for church and school libraries. 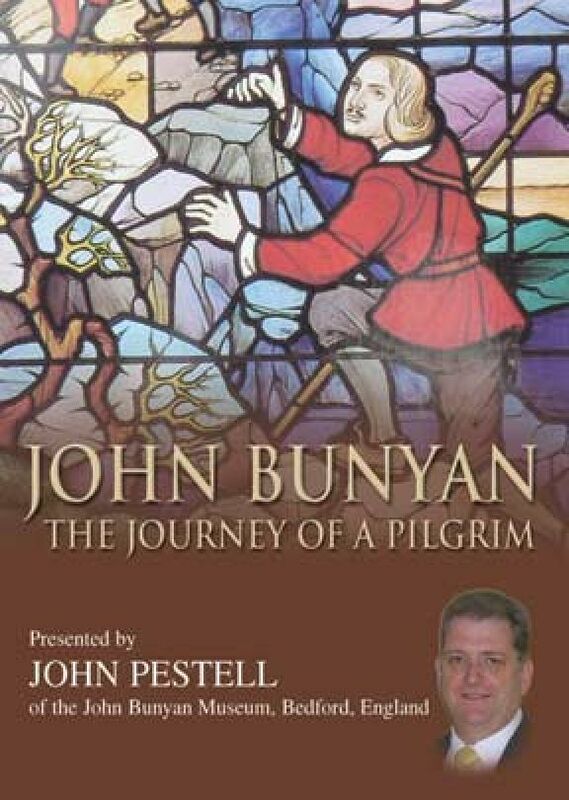 John Bunyan (1628-1688), known to most English 101 students as the author of The Pilgrim's Progress – which chronicles the struggles of the pilgrim Christian as he makes his arduous way from the City of Destruction in this world to the Celestial City in the next – is the subject of this engaging documentary. Filmed at the John Bunyan Museum in Bedford, England, the program is narrated by Bunyan scholar John Pestell (author of Travel with John Bunyan), who actually lived in the Bunyan cottage, where his parents were caretakers. Providing historical context fleshed out with artwork and illustrations, Pestell takes us from his subject's troubled childhood up through his defection from the official church, after which his illegal preaching (not allowed outside of the state church) led to his imprisonments as a nonconformist until his death. Although The Pilgrim’s Progress, written during his 12-year confinement, was a bestseller (and remains so), Bunyan also wrote other works, which are detailed here. A solid production suitable for both literature and religious history collections, this is recommended. Here is a short but interesting and informative documentary on the man who will probably live on as the writer of the most best-selling work outside of the Bible -- The Pilgrim's Progress. The documentary was produced at the Bunyan Museum in Bedford, England, and the narrator is Bunyan expert John Pestell. 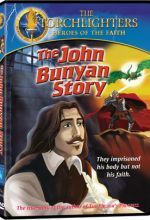 The DVD recounts Bunyan's childhood, conversion, preaching, imprisonments, writings, and death. Today it is amazing to think that Bunyan presented The Pilgrim's Progress to a printer, thinking that his work wasn't worth much.